I don’t really like watching football. it’s seems to be a very slow game to me that includes way too many commercials, odd rules and guys being jackasses for no reason. unlike baseball that has many different ways to enjoy the game like box scores, score sheets, radio, tv and actually being there football has being there (boring), watching on TV (totally forgettable) and radio (no thanks it’s way more slow than TV) and the score like 10-6. that’s it. 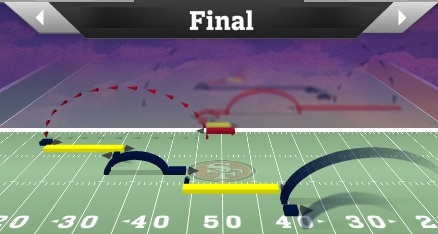 there hasn’t been a good way to visualize the game after it’s been played. until now. this new NFL tool is the bomb. it looks a lot like Time Machine in OS X. up arrow goes back in time and down arrow goes forward. you can see the distance run, a pass and a kick. if you click on the play arrow it shows you the details of what happened then as in who carried the bag, how far it went and the guy that made the sack. there is more information in the depth chart, weather and tools tabs. I very likely will not watch this for every game but I have to tell you I think it’s pretty radical. note: images used under fair use to help make a point. anything that the NFL makes is the NFLs.